A reverse mortgage allows homeowners over age 62 to access a portion of their home's equity. During the past 50 years, reverse mortgages have become increasingly popular with seniors who want to supplement their income or pay for medical expenses while staying in their homes. Ending Point If the loan is fully-amortized and held to maturity, the balance will be zero at the end of the loan The balance grows over time. At the end of the loan, the loan must be paid back usually in cash or by selling the home. If you choose to apply for a reverse mortgage, the most important thing to remember is that the loan must be paid back when the last borrower or co-borrower moves away, sells the home or dies. As with conventional mortgages, borrowers must pay closing costs and interest. Multiple loan options allow borrowers to access a specific amount of equity with flexible payment plans. These are the most common types. With a reverse line of credit, the borrower can access their home's equity as needed, which lowers long-term expenses. This option is similar to a home equity line of credit (HELOC), but it does not require monthly payments. You can compare both options while shopping for loans. Monthly payouts allow borrowers to access their home's equity over many years. Payments can be structured over a fixed term or over the owner's tenure in the home. For example, the borrower may arrange for monthly payments to be distributed over a 15-year term. Alternately, the borrower and co-borrower can receive equal payments every month that the home is occupied as a primary residence. Monthly disbursements based on tenure or term can be combined with a line of credit. This way, part of the equity is distributed monthly, and the other part can be accessed as needed. Modified tenure or term loans are available with variable interest rates only. Single-distribution reverse mortgages have traditionally been the most popular of the three HECM payout methods. They're an attractive option for homeowners who need the entire payment for a large transaction, such as paying off a conventional mortgage or purchasing another home. This is the only traditional HECM that offers fixed interest rates. There are several ways to buy a home with an HECM. Thanks to a program introduced in 2008, borrowers can apply for an HECM when they purchase a home. Previously, a homebuyer could take out a forward mortgage and use a reverse mortgage to make the payments. If a homeowner wants to purchase a more desirable property, proceeds from the sale can go toward the purchase price. When the balance is financed, a reverse mortgage can leverage the transferred equity to make all of your monthly mortgage payments. 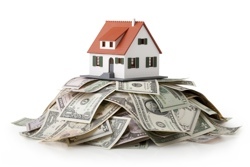 A reverse mortgage can also be used to provide financial relief following a cash purchase. Before 2010, high upfront costs were a drawback that prevented many seniors from taking out reverse mortgages. Now, homeowners who want to borrow smaller amounts can lower their initial costs. The upfront mortgage insurance premium (MIP) for HECM Saver loans is just .01 percent of the home's value compared to 2 percent for conventional options. After closing, MIP premiums increase to 1.25 percent monthly. Variable and fixed interest rates are available on these loans. Proprietary loans can offer advantages in two situations. First, if you need a small amount of money for one use, state programs or smaller lenders may offer competitive rates. However, this option is not available in all areas. Second, proprietary jumbo loans can help you to get a reverse mortgage on a home valued over $625,500, which is the FHA's limit. The main advantage of reverse mortgages is that borrowers don't have to make any monthly payments until a trigger causes the loan balance to become due ( usually within 12 months). The high cost of deferred repayment can be a downside for non-borrowing spouses and children. To repay the loan, family members can sell the home, repay the full amount in cash or take out a mortgage. Many reverse mortgages include a non-recourse clause. This means that family members only need to repay the lender for the value of the house. They will never have to pay more than your house is currently worth even if distributions and interest exceed the home's value. For a long time, applicants didn't have to meet income and credit requirements to receive a government-insured reverse mortgage. Then, default rates increased. Many borrowers who do not meet income and credit requirements can still receive a reverse mortgage if they agree to have part of the distributions set back to pay for insurance, taxes and maintenance. In the United States, so-called home equity conversion mortgages (HECMs) have been insured by the government since 1988. Some 90 percent of reverse mortgages issued today are backed by the Department of Housing and Urban Development (HUD). However, most people have more affordable ways to borrow money than a reverse mortgage. Applicants should always consider the upfront costs and long-term fees that will be passed on to the family. Closing costs include origination fees, mortgage insurance and loan servicing charges that can be up to 2 percent of the home's value. Due to the high cost, this option is best for retirees who have exhausted their primary resources. Furthermore, the amount that you can receive from a reverse mortgage depends on your age, the value of your home and interest rates. If you are ready to apply for a government-backed reverse mortgage, you will need to complete a mandatory HUD-approved counseling session. The counselor can discuss your financial goals and housing requirements. You should also talk to your family and loved ones. Reverse mortgages help many people, but alternatives are available.